For the last 20 years or so, nearly every car came with an electronic fuel injection system. And that’s created a problem for folks with older cars that use a carburetor: finding a technician who can service or repair those early fuel delivery systems. It’s the precursor to today’s electronic fuel systems. In fact, it’s how automobile and truck engines handled fuel delivery since their introduction back in the late 1800s. Sure, the later carburetors were a lot more complex than the original ones, but generally speaking, the process was the same. Then, in the 1980s, when computers began taking over engine control, those carburetors were modified to allow the computer system to take control of the air/fuel mixture. They weren’t as accurate or efficient as today’s fuel injection systems, but they were a giant leap forward in fuel efficiency. Today it’s hard to find a technician who’s versed in those early carburetors. And even the later ones are mostly unfamiliar territory for many of the technicians in the shops across the country. Your local Cottman center can help: Their technicians are familiar with every type of fuel delivery system used on the majority of cars and trucks on the road… including carburetors. They know how to adjust those carburetors to get the best performance out of them, and they know how to repair them when they aren’t working properly. They’re even versed in the electronically controlled carburetors and how to set them up for proper performance. So if your older car isn’t running properly, and you want to bring it back to its factory levels of efficiency and performance, there’s just one name to remember: Cottman. 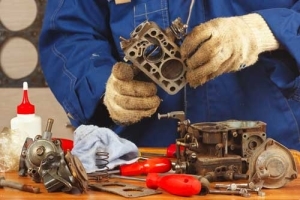 Call your local Cottman center and set up an appointment to have your carburetor checked and repaired. You won’t believe the difference!